That didn't sound right, did it? Quint from Ain't It Cool News has his part two from Disney's New York Press Conference last Tuesday. 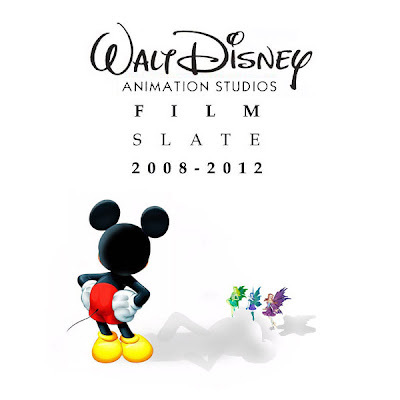 In this one he focuses on the details about the upcoming Disney animated slate for the next four years. I'm looking forward to "Rapunzel" the most and after that "Princess", but I'm really optimistic about "King of the Elves". I have a small but growing fear that Princess and the Frog might not be so good and the return to hand-drawn animation that we all hope....but It still looks promising. I'm sure the animation and music will be great, it's just the story that worries me. Who knew New Orleans had kings and queens?! The Prince in this story is visiting from another country. He's not a New Orleans native... hopefully that will ease your fears. I also desperately want a Blue Sky update for DL or WDW. I read the Quint's post yesterday and i was waiting for nearly a week!! I gave so much details, this is a real pleasure. Bolt sounds promising and i can't wait to catch the trailer (attached to Narnia 2 i read somewhere???). Hope Disney will show and talk about all these upcoming exciting Disney movies at the french festival of Annecy in June! Bolt sounds better than I was expecting. I was really hoping for the Chris Sanders version and was disappointed to see his vision changed so much, but this new one could actually work out well. Here's hoping it performs better than Meet the Robinsons. I hope Princess and the Frog does well and brings 2-D back. I don't think it will be a blockbuster, but if it performs solidly for the Mouse House then I think that's enough to bring it back to some extent. Again, it would just be weird to see Disney without handdrawn movies. King of the Elves also looks intriguing. I am definitely looking forward to Rapunzel, that looks like it could be groundbreaking just with its artwork. But I am most interested in the Tinker Bell series. If Lasseter approved it, it can't be that horrible. I must admit though that my curiosity is more about how is it that Lasseter approved this when it first sounded like a series none of the Pixar folk would even acknowledge. What about the second 2D animated feature? Is this King of the Elves? No, King of the Elves will be a 3D CG movie. Thank you Justin... but then, will there be another 2D film between Rapunzel and KotE(according to this site the number 50)? or would be after KotElves?